I’ve just got back from my sister’s house – lots of lovely food, all the family there. It was really nice to see everyone together. My nieces, (8, and 1) and nephew, (5), were as boisterous as usual, but very funny – the youngest one, Laila, has learned to ‘high five’ which she now insists on doing every time she sees me, after carefully handing me her excavated mince pie – (eat the mince, leave the pastry). But I digress. I actually wanted to rave about a cookery book I received from my youngest sister and her boyfriend – it’s fabulous, (although I think I say that about all the books I read). It’s a collection of the recipes from a small chain of very well reviewed fast food restaurants, Leon, which I am ashamed to say I’d never heard of, but both my sisters assure me that the food is wonderful. The book I have is actually book 2, and I now have book one on my Amazon wishlist. As well as the recipes there are a couple of pages dedicated to lists of store cupboard essentials, plus party menus, drinks and, most importantly, the ethos of Leon, which is to provide high quality fast food that is as fast to prepare as it is to cook, and nutritional to boot. I am so looking forward to starting on this book, as well as ‘Italia’ and ‘Kitchen Diaries’. This is a beautiful book, and exactly how a cookery book should be written. It’s not just a collection of recipes and photographs of the results, but a whole story of where the chef grew up and who influenced him. It documents the food he ate as a child and discovered as he grew up, anecdotes of his family and adventures he’s been on, and how he became successful. 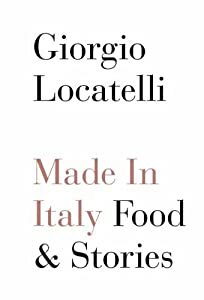 The photographs also help to tell the stories – it’s genuinely a pleasure to read and the recipes are fabulous,divided into seven sections: Antipasti; Zuppa; Risotto; Pasta; Pesce; Carne; Dolci. None of them are impossibly difficult, and the ones I have tried have produced meals that I could eat over and over again. If I could reproduce one of the photos here I would – my all time favourite is a photograph of pieces of focaccia classica on a wooden board – simple but beautiful and will, like all the others, encourage you to make it just so that you can taste how beautiful it looks! If you are in the mood for buying a new cookery book, or asking for one for a present, I highly recommend this – you won’t regret it.